Amidst a deadly drug war in Juarez, Mexico, a group of college students have emerged from the violence to tell their city that they've had enough. Spurred on by an October 29 shooting by federal police of a 19-year-old classmate during a peaceful street protest, some 20 students at the Autonomous University of Juarez have formed Asociación Estudiantil Juarense (the Student Association of Juarez). "Our first goal is to bring justice to José Darío Álvarez [who survived the shooting after emergency surgery], but our second mission is to end the corruption of police and military in the city," a 19-year-old student representative who we will call "Javier" told ABCNews.com. "A revolution without arms" is their rallying cry, and the group has organized marches in Juarez. A march in early November brought out nearly 200 people to the streets of Juarez. The students have also garnered support and expressions of solidarity from outside Juarez. Across the border in El Paso, Texas, students and community members have held weekly vigils outside the Mexican Consulate; in Mexico City, students from the National Autonomous University of Mexico, the country's largest university, have held peaceful marches and protests. The Juarez "students are quite heroic," said Bruce Bagley, who heads the Latin American affairs department at the University of Miami. "The fact that they are standing up to the military has highlighted the fact that the military in its conduct of the war on drugs in Mexico has actually fallen into numerous human rights violations. "As student groups, they are not protected by anybody. They better be very careful," continued Bagley. "Mexico has a history of not putting military or police on campuses, and if the students started to target the violence of the drug gangs and the cartels, they would be extraordinarily vulnerable in one of the most violent areas of Mexico." President Felipe Calderon declared war on Mexico's drug cartels when he took office in December 2006. He immediately sent thousands of military troops and hundreds of federal police into Mexico's border towns. Calderon's war fueled an already bloody battle between Mexico's largest cartel, the Sinaloa cartel, and Juarez's hometown cartel. Juarez is now the epicenter of violence in Mexico. According to Bagley, the military and federal police have proven largely ineffective in fighting Calderon's war on drugs in Juarez. "It is a combination of the size of Juarez, lack of familiarity, lack of good intelligence, and corruption," said Bagley. "All of which is enveloped in the existing reality that Juarez is one of the major crossing points and the money to be made is huge." In recent years, the border town of 1.3 million people, which reported more than 3,000 homicides in 2010, has been particularly dangerous for young people. On January 31, armed gunmen broke into a high school party, killing 15 students. In an eerily similar attack, gunmen stormed a house party on October 23, killing 14 people between the ages of 14 and 30. The catalyst for the students' organizing came on October 29, when José Darío Álvarez was shot by Mexican federal police during a peaceful protest for the demilitarization of the city of Juarez. A sociology major at UACJ, Álvarez was part of a small, masked and unarmed group that had allegedly trailed behind the protest march to spray-paint political slogans on nearby walls. Authorities say federal police came across the students in the act and when the students began to run, the police chased them toward the university entrance. As the students entered the campus, police opened fire, hitting Álvarez in the back and critically injuring him. The scene was captured on camera by a bystander and posted to youtube, where it has over 31,100 hits. The video is graphic: It shows Álvarez bleeding on the ground, his intestines spilling out through the bullet's exit wound. 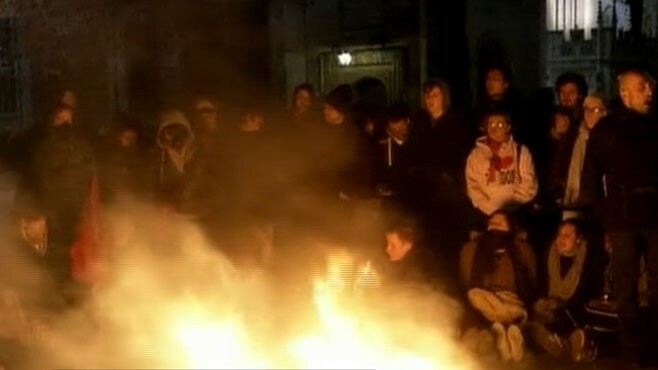 Students and activists have used the video as evidence for their case against the authorities. The local El Diario newspaper in Juarez posted it to their website the day of the incident; the video immediately sparked outrage on campus. Student-representative Javier claims that the shooting is "just one example of how Felipe Calderon's war on drugs has created a smoke cloud over Juarez. The corruption in the government gets mixed in with the war on drugs. This is why we are demanding the demilitarization of our streets. "We are not asking [the federal police and the military] to be removed completely right now, because that is impossible, but to begin an initiative to resolve this problem," he added. The Student Association has not confined its activities to political activism. Members teamed up with medical and dentistry students doing a Health Brigade event and implemented Pistolitas por Libros, the first Pistols for Books campaign. While adults in the neighborhood sought free medical advice from the students, their children could exchange toy guns and weapons for books, games and other, more peaceful, items. The organization said between 120 and 150 participated. The exchange took place during the opening of the Josefina Reyes Community Library. Reyes was a well-known human-rights activist who was killed on January 3 during an attempted kidnapping. Reyes constantly spoke out about human-rights abuses by Juarez's military and advocated for demilitarization. Amnesty International condemned the killing of Reyes and released a statement saying that they believe other human rights defenders are also at risk of intimidation and attacks. According to Carlos Gonzalez, spokesperson for the Chihuahua State Attorney General's Office, the two police officers involved in the Álvarez shooting were suspended and charged with battery and abuse of authority, not attempted homicide. "At this moment they are investigating to see if there are any more charges to be brought to the case," Gonzalez told ABCNews.com. "The judge will make a decision then." Javier has a different take. "I question the way they charged the police officers who were involved in the shooting, because of the nature of the charges," he said, and went on to speculate that someone might have paid or influenced the authorities to scale back to charges that he claimed do not usually involve a shooting. As to his involvement with Student Association of Juarez, Javier said, "Being an activist puts more pressure on me, because the threat is higher, but we need to open people's knowledge of other types of corruption in this city, like in the case of José Darío Álvarez. "Just living in this city I am risking my life," he added. "When I get on a bus, or drive on the expressway, I don't know if I'll come back alive."